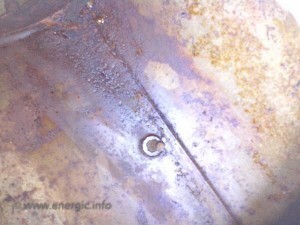 Energic initially with the B, B4, B5 and C7 B4L models used a fuel tank which had a high raised outer screw top (which was welded into place). 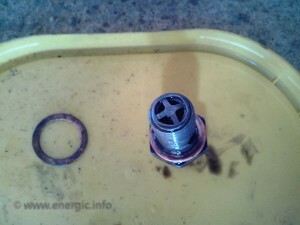 This required a pin holed holed (air breather) heavy cast aluminium screw lid, with grip edges. This tank was just for petrol and had a capacity of 7 litres. 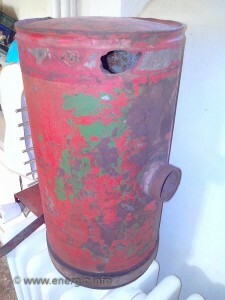 This fuel tank is typical of the early types fitted. It is repairable, and illustrates the high raised screw outer lip. Many early tanks suffered from extensive rust where the securing band, holding the fuel tank to the supports touched the tank. 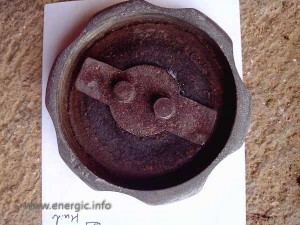 Just a matter of time with the rubbing of the two vibrating surfaces, with the motoculteur in operation, till the galvanized surface was susceptible to rust intrusion from abrasion. 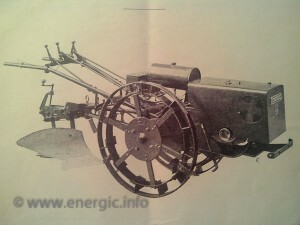 The Energic motoculteurs C7 and D9, using the S bloc moteurs, used a galvanized fuel tank of 9 liters, with a separate oil tank return reservoir in front of approx. 4 liters. This constant circulating system was pressurized by the crankcase compression and controlled by a float system. 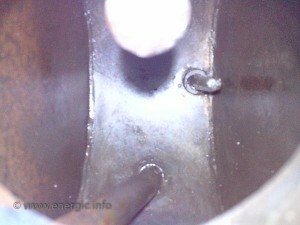 Here is a typical S Bloc arrangement the oil tank positioned in front of the fuel tank. 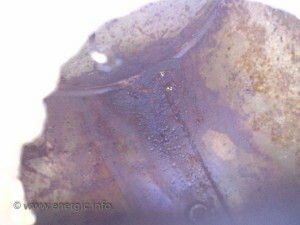 Inside fuel tank, slight corrosion, with gauze down pipe filter. Fuel 98 octane min, with additional lead content which was required to part lubricate the lateral valves (inlet and exhaust ports). Today we should add a additive lead supplement to the fuel to help in this essential task. 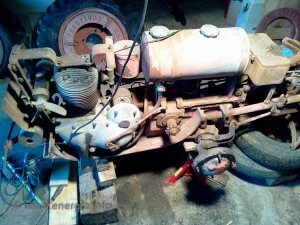 Some people add a very small amount of 2 stroke oil to the petrol as well. This slightly reduces the efficiency of the combustion, but would help lubricate the moteurs valves.